Over the years we’ve noticed that it rains early in the season, but, then, drought starts and continues until fall. If we have rain at all, it’s very little – less than an inch per rainfall. For a variety of reasons we don’t add water from hoses, etc. This means that only the toughest of the many hundreds of plants we’ve planted have survived in our garden. I’ve been taking inventory of what plants have survived and the total is a lot more than I thought. I hope to make a list of plants that have survived with little or no rain over the past 30 plus years. You Can See All Of Our Current Photos Now! Links to all of the Current Photos are now available under the last Current Photo shown. Take a look. Today is July 10 and it’s time to update our current photos. Daylilies are in bloom now so take a look at some of our lovely flowers on our “Current Photos” page. Carbon emissions —– greenhouse gases —– global warming —– carbon offset credit —– etc. I’ve been hearing and reading so much lately about these subjects. I understand that the world must reduce its dependence on fossil fuels to reduce greenhouse effects on our planet and find other ways to produce energy. While we are in the process of doing this (which will take many years, if not decades) why don’t we take the initiative and plant trees and shrubs as well as other plants on our own properties to help reduce carbon emissions in our atmosphere? Trees and shrubs (and other green plants as well) take in carbon dioxide from the atmosphere and through a complex chemical action called photosynthesis make sugar for food and release oxygen into the atmosphere. In effect, plants scrub the air clean for us. The major reason for the increase in greenhouse gases is the use of fossil fuels. Another reason is the reduction in the world’s forests. To help overcome the reduction of forests throughout the world, homeowners, farmers, and businesses should make a commitment to plant trees and shrubs on their properties. * Reduce heat islands in cities. Haven’t you noticed how hot it is on the sidewalks outside your place of business. It was sometimes bad enough that I didn’t want to walk to the bus to go home! Widespread planting of appropriate trees in a city can decrease local surface and air temperatures by several degrees. * Proper planting around homes and buildings directly cools the interior of homes and buildings, decreasing air conditioning costs and peak energy demand. Trees and vegetation cool the air by providing shade and through the evaporation of water from their leaves. Shade reduces the amount of solar radiation transmitted to underlying surfaces, keeping them cool. Shaded areas can be up to 20 degrees cooler than the temperatures of unshaded surfaces. These cooler walls decrease the quantity of heat transmitted to buildings, thus lowering air conditioning cooling costs. Cooler surfaces also lessen the heat island effect by reducing heat transfer to the surrounding air. * Vegetation helps with stormwater management. During rain the ground can become saturated and turn excess rainfall into runoff. Stormwater runoff problems, such as flooding and polluting of open water bodies, are worsened by the large amounts of water-resistant surfaces in urban and suburban areas. Trees and vegetation can help reduce the runoff problem by decreasing the volume of runoff. Researchers found that evergreens, conifers, and trees in full leaf can intercept up to 36% of the rainfall that hits them. Because groundcovers like Pachysandra terminalis (Japanese Spurge) can absorb water they also help reduce runoff. * Trees and vegetation can help reduce noise. They also provide shade from harmful ultraviolet radiation, particularly in playgrounds, schoolyards, and picnic areas. In addition, trees and vegetation increase property values, as several studies have shown. Community gardens and neighborhood parks help reduce physiological stress, aesthetically improve an area, and provide an habitat for birds, animals, and insects. How to choose a tree? Choose low-maintenance native trees to maximize carbon absorption. The tree should also be appropriate for the site. Of course, the larger growing trees are best as they absorb more carbon, but it is better to plant an appropriate tree than one that will not survive long in the site. American Forests magazine list the Common Horse-chestnut, Black Walnut, American Sweetgum, Ponderosa Pine, Red Pine, White Pine, London Plane, Douglas Fir, Scarlet Oak, Red Oak, Virginia Live Oak and Bald Cypress as examples of trees especially good at absorbing and storing carbon dioxide. An article in that magazine advises to avoid trees that require a lot of maintenance, as the burning of fossil fuels to power equipment like trucks and chainsaws will only erase the carbon absorption gains otherwise made. Ultimately, trees and other vegetation of any shape, size or genetic origin help absorb carbon. Most scientists agree that the least expensive and perhaps easiest way for individuals to help offset the carbon emissions that they generate in their everyday lives is to plant trees…any tree, as long as it is appropriate for the given region and climate. What a wonderful spring it has been! The winter was somewhat rainy with very little snow. I think the plants, including all of the potted plants, enjoyed the rain. The plants just burst out of their winter sleep with such exuberance. They were all so beautiful, with lots of flowers and large leaves. Some of the hostas showed some torn foliage which I think is due to the cool temperatures. Their leaves unfurled late but they have put out so many new leaves that the torn leaves are not so noticeable. Even though the two Chinese peonies are in a part shady site, both of them put on a splendid show with the large, frilly leaves opening in the morning and closing up at night. Our area has a lot of Yoshino cherries and they were beautiful beyond description. Even our “Akebono” did very well with its flowers staying pink instead of turning white as they normally do. There has been so much new growth on our trees that the trees are loaded with soft limbs that hang almost down to the ground. The “Dancing Peacock” Japanese maple will have to be pruned and I think several others will need pruning as well. Hot and humid. Those are the keywords that describe the weather this week. Hazy also can be used because of the air stagnation. Hot and humid is it. I woke up today at 7 a.m. and the temperature is already 78 degrees Fahrenheit. Whew! It’s the kind of day that you really appreciate your home and the air conditioner cooling the home’s air. I feel sorry for all of my plants having to stay outside in this wicked weather. Some plants like it hot as long as they get enough moisture. Pentas or Egyptian Starflower comes to mind as an annual (tender perennial?) that does well only when the days are very hot. It just sits there as a small plant through June. Late in June it starts to awaken and starts growing into the full and beautiful plant that it is. Egyptian Starflower comes in white, pink, and various shades of red. My favorite is the bright red color. I like to grow one plant each in three different containers, putting the containers close to each other but at different heights. Each plant does very well in a 10-inch pot. 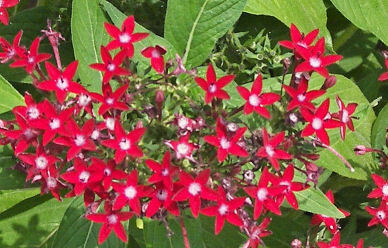 Pentas is not as common as Pentunia but it is well worth the extra work to find this plant.